Collin and I love movies. We especially love them when going to see them benefits a worthy cause--so every year, on the first Saturday in December, we can be found at the Cans Film Festival. 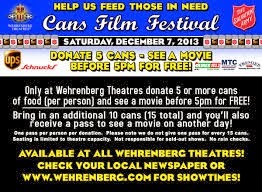 The Cans Film Festival is an annual event held by the Salvation Army and Wehrenberg Theaters--take five cans of food, see a movie. Pretty simple, huh? Not the first time, but the organizers figured that out quickly--after having to deal with a lot of cold, angry people stuck waiting outside a theater, wondering if they'd ever get out of the lines and into the seats to see the movie of their choice. My mother was still with us that first time--it was before her first major stroke, and she could still walk and drive. This year, I wasn't sure I'd be attending. I've been having a lot of problems related to arthritis in recent weeks. Sometimes, I need a cane just to get from the living room to the kitchen. I knew I'd never be able to navigate a crowded movie theater and icy sidewalks--but thanks to my friend Carolyn and her church, who loaned me a wheelchair, and my friend Cathy, who picked it up and delivered it for me, I didn't have to. When we arrived at the theater, Collin spotted familiar faces right away--friends from church, Nicole, Kitty and Kyle (Nicole and Kyle are very talented writers, by the way--you're going to be seeing a lot of both of them in the future). They'd just come from seeing a movie--so we were surprised to see Nicole and Kyle in the theater later, seeing the same movie we were seeing. Like Collin and me, Kyle had seen Thor: The Dark World already, but we just can't get enough of Thor and Loki! After the movie, Collin and I went to the Schnucks across the street to buy some groceries before heading home--and there, ahead of us in the self-checkout line, was Kyle, making a few purchases before going back to see yet another movie! Be sure to check out William's review of his favorite Christmas movie, Die Hard (yes, I know....) and his latest photoblog, skyline images of his hometown! It's a wonderful cause, this time of year, and it's really not that difficult to make the donation. And you get movies for your donation, so it's a win win! It really draws a crowd--every city should have a Cans Film Festival! Sounds like fun. Used to take my girls to ball games for the same reason. We each brought a can of food to see a baseball game once a year. Awwwwwwwwww, I remember your last post about this, a movie and a good cause. I have stopped beating myself over my lack of mobility in the last few months. I walk now with a walker everywhere I can right now and it really helps. Walking with a cane and being in massive pain makes me super grouchy ! Yes I am still upset that I can't walk like I use to but at lest I am out and about. Plus all the giggles I have trying to put the walker in my car. Talk about 100 clowns getting out of a VW Bug ! I tried to get around with the chair without Collin pushing it. I found I'm a lousy driver in a wheelchair, too! What a wonderful idea! Our food banks here are running low and this would certainly help fill them up. And as long as you're walking, who cares how? Keep it up! Take the idea to your local theaters--it can't hurt to suggest it! Lulu--suggest it to the managers at your local theaters--you never know! You've had a cane, too--ohhhhhh! More theaters should team up with the Salvation Army and make the Cans Film Festival international! What a fab idea, I must admit the Salvation Army is one of my favourite charities.. I'm with you though Norma, i don't think i could sit through three movies one after the other.. I'd be thinking about all the things i should be doing :) I'm guessing the colder weather doesn't help very much as far as the aches and pains go, I wish I could send you some of our heat.. you know I would if I could! Grace, I look at your photos and others from Australia and wish I were there!